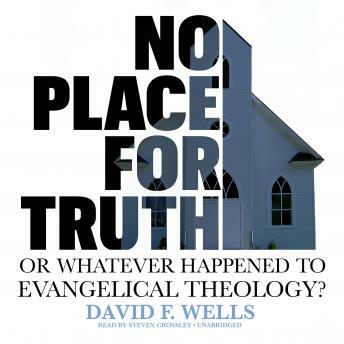 No Place for Truth: or, Whatever Happened to Evangelical Theology? Has something indeed happened to evangelical theology and to evangelical churches? According to David Wells, the evidence indicates that evangelical pastors have abandoned their traditional role as ministers of the Word to become therapists and "managers of the small enterprises we call churches." Along with their parishioners, they have abandoned genuine Christianity and biblical truth in favor of the sort of inner-directed experiential religion that now pervades Western society.Specifically, Wells explores the wholesale disappearance of theology in the church, the academy, and modern culture. Western culture as a whole, argues Wells, has been transformed by modernity, and the church has simply gone with the flow. The new environment in which we live, with its huge cities, triumphant capitalism, invasive technology, and pervasive amusements, has vanquished and homogenized the entire world. While the modern world has produced astonishing abundance, it has also taken a toll on the human spirit, emptying it of enduring meaning and morality.Seeking respite from the acids of modernity, people today have increasingly turned to religions and therapies centered on the self. And, whether consciously or not, evangelicals have taken the same path, refashioning their faith into a religion of the self. They have been co-opted by modernity, have sold their soul for a mess of pottage. According to Wells, they have lost the truth that God stands outside all human experience, that he still summons sinners to repentance and belief regardless of their self-image, and that he calls his church to stand fast in his truth against the blandishments of a godless world.The first of three volumes meant to encourage renewal in evangelical theology (the other two to be written by Cornelius Plantinga Jr. and Mark Noll), No Place for Truth is a contemporary jeremiad, a clarion call to all evangelicals to note well what a pass they have come to in capitulating to modernity, what a risk they are running by abandoning historic orthodoxy. It is provocative reading for scholars, ministers, seminary students, and all theologically concerned individuals.